Generally speaking, a custom made garment will cost more than an off-the-rack garment. And generally speaking, it will be considerably better made, will fit you better, and will last longer. There are sometimes exceptions to the rule that custom costs more; some high end designers charge an incredible premium for their name on the label, and I don’t, so there’s a savings in that. Some things tend to be marked up far more than they need to be when they’re sold in stores – like overpriced veils at bridal salons. But generally speaking, off-the-rack clothes are mass produced, and there’s an economy of scale there that is lost in the world of one-of-a-kind. When I sew a custom garment, I draft a unique pattern specific to the design my client has requested, sized to her precise measurements rather than a “dress size.” I personally help to select the fabrics for her garment, cut them by hand, and sew a garment for her that has never existed before. I devote several hours to the design process, the pattern drafting, the materials shopping, and the muslin fitting, even before beginning work on her actual garment, that off-the-rack clothing manufacturers don’t have to do (or perhaps only have to do once in every thousand or hundred thousand or million garments they churn out). The quality of the garment and of the experience a dressmaker provides are incomparable to buying a garment on a hanger. The price reflects this. Still, how much it costs, depends. It depends on how complex the design for your garment is. I will draft your pattern, sew a mock-up, fit you, and cut and sew your final garment. If your garment is, for example, an unlined shift dress made from 3 pieces of fabric cut from 2 pattern pieces, each and every one of these steps is going to take considerably less time than if your garment is an elaborate bridal gown with a fitted bodice, corset style back, full ballgown skirt with over lays and pickups and the like. The last bridal gown I made had 27 unique pattern pieces when all was said and done and took a little over 100 hours to cut and sew (which is in addition to time spent discussing the design with my client, shopping for materials, and thinking about the best approach to constructing her gown). The level of complexity has a big impact on the total price. It depends on what fabrics you choose. Some fabrics cost considerably more than others and some fabrics require special care to work with. To the best of my ability, I’ll let you know when it’s worth the extra expense – when it will make your garment really fabulous, and when it will make your garment more durable and able to last longer. Sometimes there are a variety of fabrics that are suitable. If you fall in love with the most expensive fabric, the price of your garment will reflect that. It depends on how much fabric you need. A full length dress requires more yardage than a knee length dress. A ballgown silohuette takes more fabric than a narrow A-line. A gown with multiple layers in the skirt takes more fabric than a dress with a single layer. More fabric costs more because there’s a greater material cost, and also because it takes more time to cut, sew, and hem the extra length. It depends on how fast you need it. Rush orders cost more, if I’m able to take them on at all. It’s not just because I prefer not to be rushed; they cost me more too, since there are rush fees for any materials I have to order extra quickly, and since my working overtime costs me money in other places (like a babysitter while I hem your dress or pizza for dinner three nights in a week when I’m too busy sewing to cook). Orders placed early on are more cost effective, and usually more fun as well. So you can see, there are a lot of factors that go into determining the price for a custom garment (it’s not nearly as simple as how much “a bridal gown” costs). When you send me a quote request on my website, I’ll always respond with follow up questions to try to get a clearer understanding of your goals, both for the design of your garment and the budget you’d like me to respect. Please believe, I’m not trying to gain some sort of negotiating upper hand. I’m trying to be sure that as we discuss the design options, I make recommendations that are appropriate for your goals. I don’t want to tempt you with fabrics or design options that are outside your budget any more than I’d want to make suggestions that are contrary to the vision you want to achieve. My passion in this job is to help other women – to help your design become reality, help you create a garment you couldn’t find out there already. So I’m thrilled to work with you to make your vision fit your budget when it’s possible; I can do all of the following things to help achieve this: I can recommend design elements that fit your budget. I can help you find good values in fabrics and other materials. I can construct your garment well, so that it lasts longer than off-the-rack clothes and is more affordable in the long run. I can make your garment to fit you properly, so that alterations are not needed as an extra expense. And I can take the time to listen to your needs and ensure that the value you have in your custom garment are worth every penny that it costs. But, there are also compromises I won’t make to reduce the cost of your garment. I won’t use fabrics that are poor quality or ill suited to the design you want. I won’t promise more than I can deliver for the budget and time frame at our disposal. I won’t cut corners on the construction. And, so that I don’t have to, I won’t undercharge for my labor. You are investing in a one-of-a-kind garment that is supposed to be beautiful and unique to you; I’m committed to the quality of my work and won’t compromise where that’s involved. In the end I know this means that not every prospective client will choose to work with me, and that’s okay. Realistically, it would not be possible for me to accept every garment I’m approached with. Furthermore, I sincerely respect your needs and your budget. So, I will provide you with good honest information to enable you to make an informed decision on whether or not I’m the right dressmaker for you. If you decide that I am, I can assure you it will be worth the cost. Quick post today, as I’m pleasantly exhausted from a long day playing with my Girly. 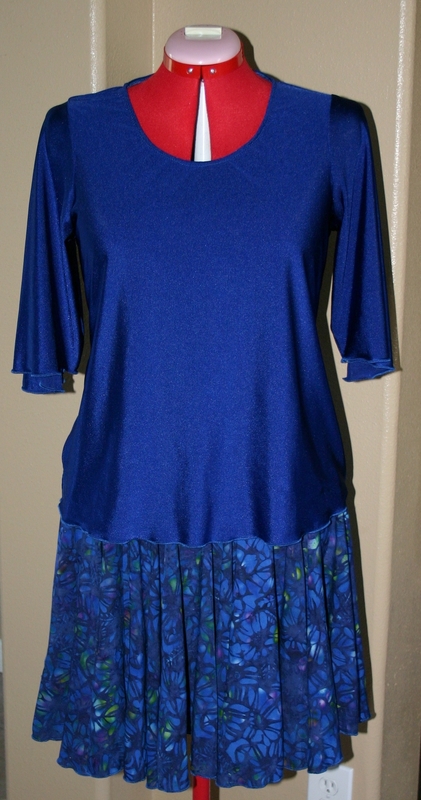 The following pics are of a custom skirt and top that I made for another loved one for Christmas. 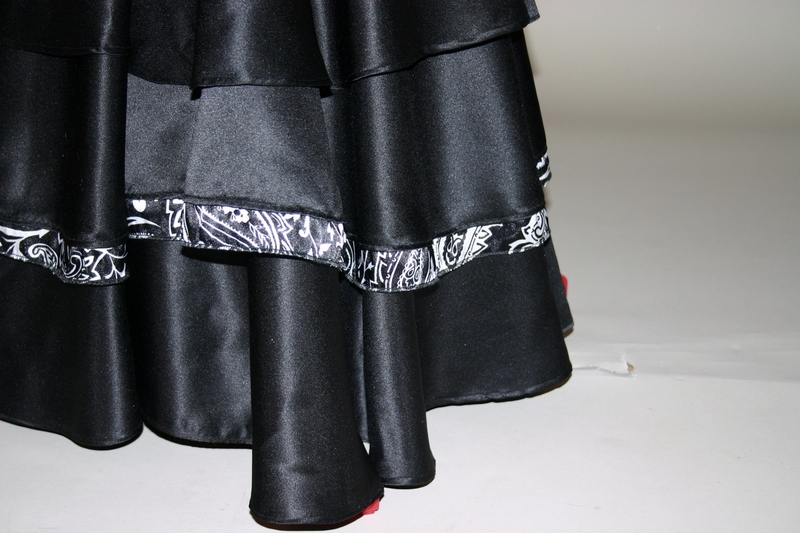 The skirt is a rayon batik fabric, cut into a very full and flouncy 2 1/2 circle skirt! 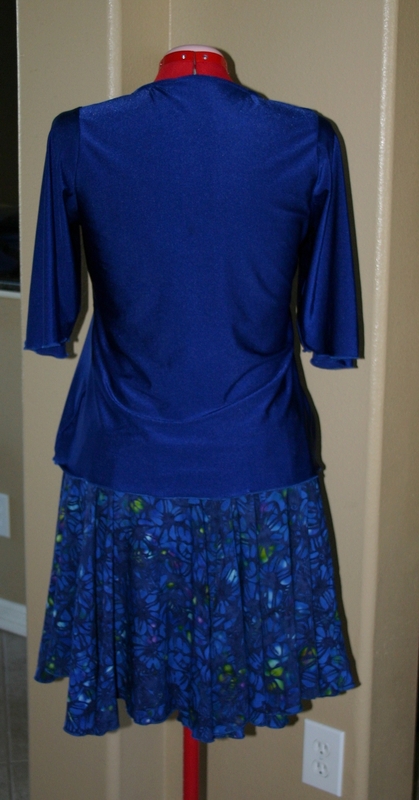 The top is made from a nylon stretch fabric, hand dyed royal blue to match the skirt. One of my local clients for whom I made a dress previously, using a commercial pattern she loved, returned to have me bring to life a design idea of her own. I *love* these sorts of projects, the opportunity to create something truly unique, and to help a client who would otherwise be unable to realize their vision. 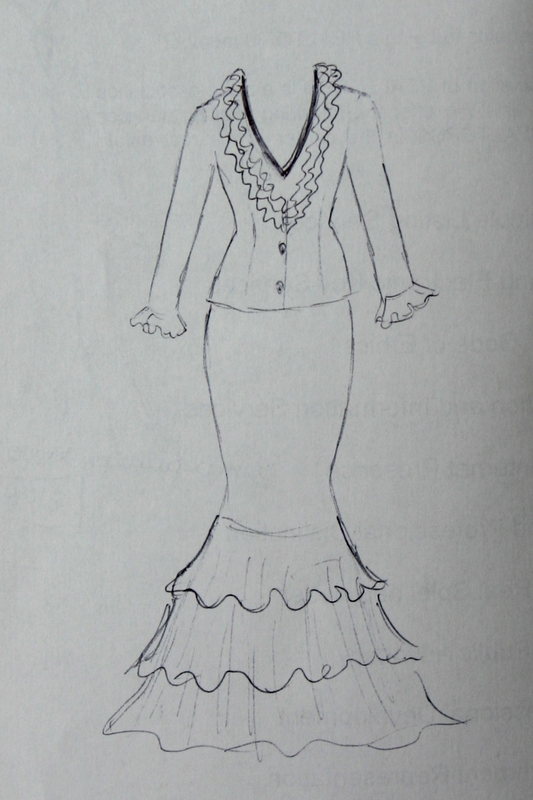 Hillary described her idea to me in depth, we talked back and forth about the fabrics to use and the best way to construct it, and then I sketched out what I pictured from her description. I set about pattern drafting, draping, and bringing a muslin mock-up into being so that we could check the fit and fine tune the design. And then, at last, the final product! 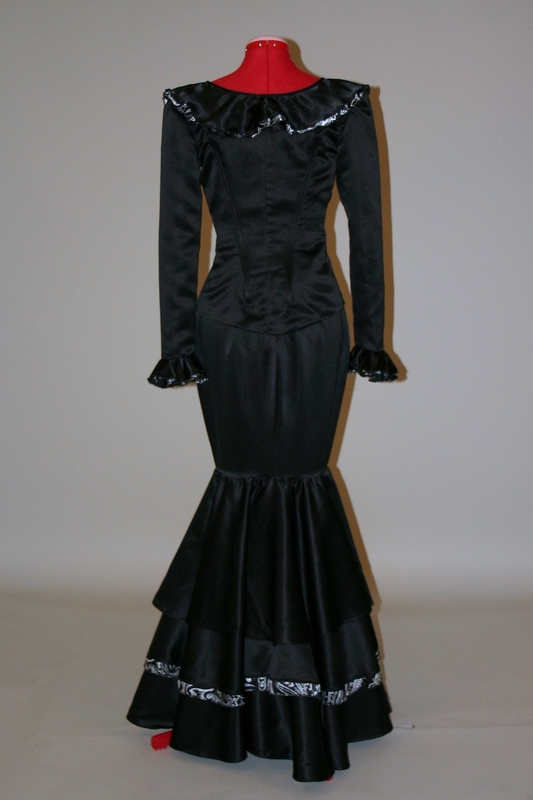 The custom ensemble consists of a mermaid shaped skirt made of black matte satin. It’s fully lined, with layers of petticoat netting at the bottom to hold the shape of the skirt. On the outside, three tiers of satin ruffles cascade down, with a little hint of black and white paisley charmeuse peeking out of the middle ruffle. 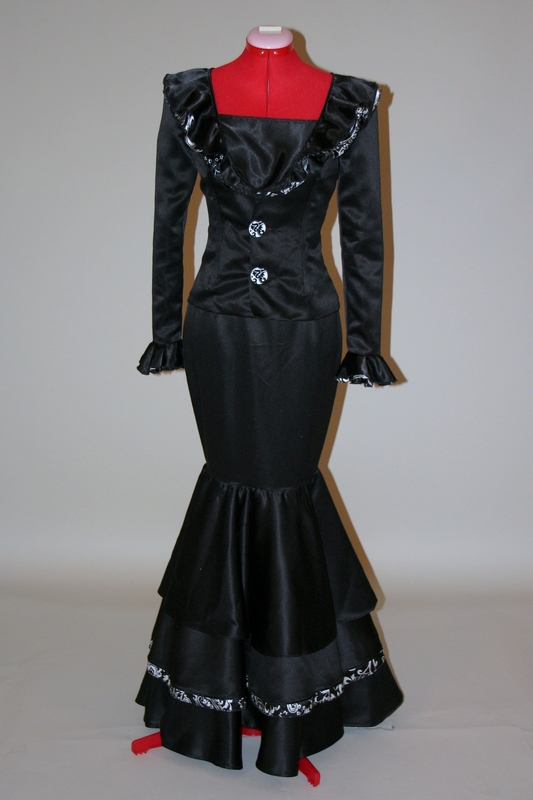 The jacket is also made of black matte satin, with black charmeuse and paisley charmeuse ruffles at the sleeve hems and neckline. The jacket body is extremely fitted, and has several pieces of boning to help hold its dramatic shape. The finishing touch – those buttons! Hillary brought a dozen different buttons over to hold up to the nearly-finished jacket so we could pick the perfect pair. And aren’t they FABULOUS? Really just the right finishing touch! And, the whole thing looks amazing on Hillary – a perfect fit both for her figure and her self! This beautiful gown was custom made for an Etsy client who was married a few months ago. The design was heavily influenced by an inspiration photo she found. 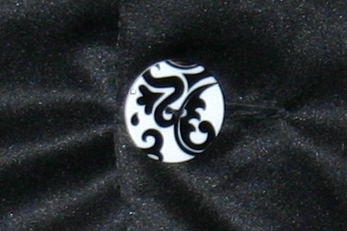 It’s a strapless white satin gown with a short train, with an open front lace jacket that ties on with a chiffon sash onto which I hand sewed the beautiful broach you see pictured. This one was a lot of fun to make. My best wishes to the bride and groom!